After the sun goes down and the stars come out, the dark bays of Puerto Rico become illuminated by tiny bioluminescent plankton: one of the most spectacular sights in the Caribbean. Puerto Rico is home to some of the few remaining bioluminescent bays on the planet. Here are some places where you can enjoy the view from a kayak. Located within Las Cabezas De San Juan nature reserve, mangrove-lined Laguna Grande sits on the northeastern coast of Puerto Rico, and its calm waters make paddling easy. The world’s only bioluminescent lagoon shines with a blue-green light from thousands of tiny pyrodiniums bahamenses organisms as your kayak cuts through the water. The island of Vieques, situated off the coast of mainland Puerto Rico, has its own bioluminescent bay, and it is considered the brightest in Puerto Rico. Though Mosquito Bay isn’t as easily accessible as Laguna Grande, the blue-green glow produced by the dinoflagellates in these waters is a worthy reward for your efforts. Nighttime tours typically involve an overnight stay on the island, and offer insight into the biology of these microorganisms and the role they play in the island’s ecosystems. The third of Puerto Rico’s bioluminescent bays is situated near the town of Lajas, making it the most accessible of the three. If you’re not into night kayaking, you can visit the bay on a guided boat trip, which often includes the opportunity to don snorkeling gear and jump in the gentle glowing water. Kayak on Puerto Rico’s “Big Lagoon” in the evening to see it light up with the natural glow of bioluminescent organisms. Paddle roughly one mile on this 5-hour small-group tour from San Juan to one of Puerto Rico’s most popular natural attractions. Kayak through the waters of Laguna Grande, the only bioluminescent lagoon in the world, during this 5-hour tour from San Juan. Under the starry night sky and the historic Fajardo lighthouse looming above, watch the glowing organisms in the water light up as your kayak slices through the water. Paddle through stands of mangrove trees and watch small fish dart through the water underneath your boat like shooting stars. Stop for a break with snacks and refreshments before heading back to your starting point. Use of all kayaking equipment and round-trip hotel transfers are included. Paddle through the beautiful bioluminescent bay near Fajardo on this 2-hour kayak tour. 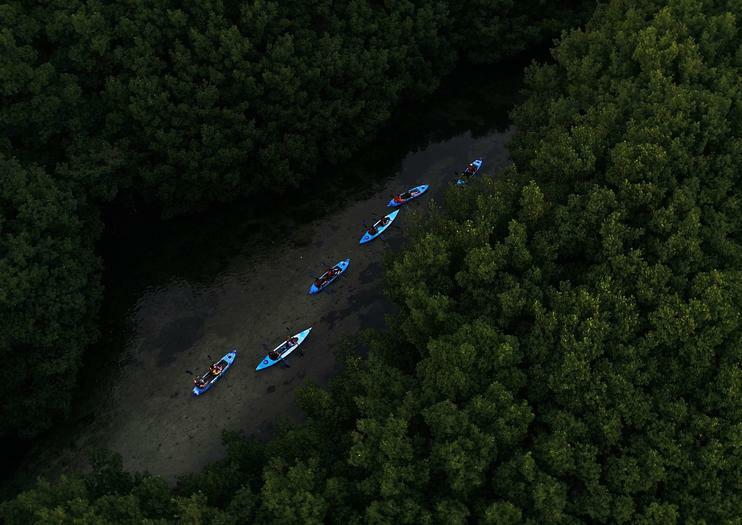 Traverse the extensive mangrove forests with your marine biologist tour guide and learn about the science behind this natural phenomenon that occurs in Laguna Grande. See the lights twinkle below the water as you paddle along and admire the beautiful coastal scenery at dusk before heading back to the starting point. See many of Puerto Rico's top natural attractions in a single day on this half-day experience from the San Juan area. Hike through a rain forest, relax at the beach, and swim through a bioluminescent bay, all with a guide who will teach you about local wildlife as you go.